When you're prepping for hurricane season, it's easy to get caught up in protecting your house and making sure you're stocked with basic supplies. You may totally forget about your car. This is a mistake — in a natural disaster, your car might be your saving grace. Before hurricane season starts, do a basic maintenance check. Get the oil changed, top off the wiper fluid, check the tire pressure, and clean the battery terminals. If you're mechanically inclined and have the tools, you can do these tasks yourself; while you do, check some other basics. Otherwise, take it to your mechanic to get an oil change and an inspection. Only use approved containers, and store them outside or in your garage or shed. Keep them away from children, and don't store them near pilot lights or ignition sources. Don't store gas indefinitely; it goes bad. Periodically use what's in the cans to fill your car, and then refill the cans. Make sure your auto insurance is up to date. Print out a copy of your policy information and keep it tucked in the glove box of your car. It might not be easy to access your personal files if you have to evacuate. With your insurance information on hand, even if your car is damaged, you can start the coverage process immediately. 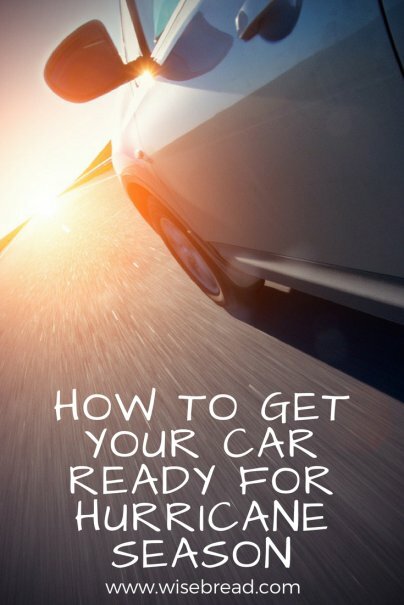 The next move in prepping your car for hurricane season is to consider what you might need if you have to quickly evacuate, or if you're not able to reach your house for some time. You can purchase a pre-packed emergency kit, or make your own emergency kit. Stock your kit with first-aid and any medication that your family members might need. It's also a good idea to have a couple of quarts of oil on hand, so you can top off your oil, if needed. Check that you have everything for changing a tire, too: a tire iron, a jack, and (of course) a spare tire. A good set of jumper cables is also a must. If you don't need them, chances are someone else will. Weathering a storm is all about helping one another. Keep some food basics in your car, as well. Start with bottled water, then add some nonperishable items that won't be damaged by heat. Dried fruit, nuts, beef jerky, and crackers work well. Protein gels can be helpful, too. The goal is maximum nutrition for minimal space. Don't forget about money. Hurricanes and tropical storms can damage telecommunication lines and towers; if that happens, you might not be able to get cash from an ATM or even from your bank until repairs are completed. Keep a stash of cash hidden safely in your car. Consider at least $200 per person, if possible. The incredibly strong winds that come with a hurricane can cause all sorts of things to fly through the air. If you're going to wait out the weather, park your car in a sheltered area. A covered garage is best. If that's not available, secure a tarp over your car to protect the paint. Parking it close to a building can provide some shelter from wind, but beware of balconies or signage that might fall off and damage your car.